A handsome couple sits quietly, side-by-side, studying cooking and mechanical repair. The household robot, after slaving away in the kitchen preparing baked Alaska, takes a break and plays Mozart. Strange? No, it’s an average day playing The Sims. I had an hour on my hands and a few brains cells to burn. What, oh what, should I do with that time? Read? Interact with other humans? Get out for some fresh air? No, too cold. Run some errands? Nope, too tired. Let’s go play newest The Sims 2 expansion pack, Open for Business. All of you so-called real gamers can start rolling your eyes and make a quick escape by clicking the back button on your browser. For those of you who are liberal minded enough to admit any game that has been around this long probably has some merit to it, continue reading. Wiping my nose with the back of my hand and swaggering into a pseudo macho stance I say, "Yeah, I play The Sims. What of it?" I pre-ordered the expansion pack as soon as it was possible to do so, on Amazon.com. My daughters are rabid fans and have been since the first version. Personally, I hadn’t played the last two expansions, my time being consumed with the likes of WOW. However, I knew I was going to play this version at some point. This was the version that had brought the features I had been trying to simulate directly into the game. Hot damn! I’m vindicated. I can now proclaim that the way I had attempted to play the game, as creative and forward-thinking, not madness. My typical scenario for Sims-play was to establish a family that lived and worked on their property. I liked having access to my creations 24 by 7. I wasn’t a fan of the disappearing act known as work, where your Sims returned to you at the end of their shift. To avoid this, I had them spend their work-day mastering the limited set of objects by which you could earn a few dollars. Nothing more than pocket change could be acquired in that fashion – certainly not enough to support a household. And of course, I liked lots of pretty furnishings, clothing and lush landscaping, all of which was very expensive. But what is the point of playing house if you can’t afford the frills? In my book, there is no point. If I want economic reality, all I have to do is turn off my computer and head to my real life mailbox. That’s not what I’m looking for when I play games. To support my stay at home families, swinging singles, The Office knock-offs and alike, I was forced to resort to the popular "motherlode" cheat, which adds 50K Simoleans at a time to your bank account. Open for Business (OP) has changed all of that now. You can run various businesses directly from your home. For traditionalists, you can purchase and run a community (retail) lot for your venture. With the exception of restaurants, all forms of commerce which had been restricted to being game controlled, can be replicated on residential property, and run as a side or fulltime business. I bow low to the EA and Maxis gods of Simmery. OP provides you with the equipment to build a few standard business models such as Bakery, Toy Shop, Florist, Robotics, Night Clubs, Bowling Alley, Clothier, etc. The best news is that you are not limited to the typical and can create whatever you dare to dream. You can even hire and train employees. ‘Nuf said. This is the best TS2 expansion ever. I’m trying to run a home florist. I’ll let you know how it turns out. For the time being my Sim, her hubby and the three house robots are building up our stock. 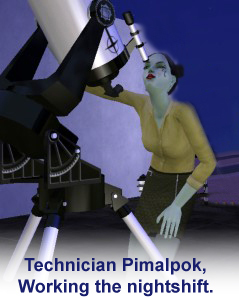 Pimpalpok was from a family of scientists that I wanted to use to observe an alien abuduction. Unfortunately, no one was ever taken by the aliens. Sandy and Tom were house-mates in a hotel of singles where I wanted to see if particular sets of zodiac signs would actually mate. Out of the 8 household members only one couple materialized and from astrological signs that should have hated each other. So much for Linda Goodman's book, "Love Signs". The Freakshow was a sitcom of sorts based on former co-workers. 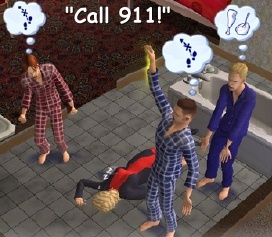 Each Sim was made to look very much like the person they represented. Either TS2's a.i. is astounding or I had a large string of coincidences. Couples that had formed in real life, eventually occurred in the game, as the did office booze hounds and partiers. 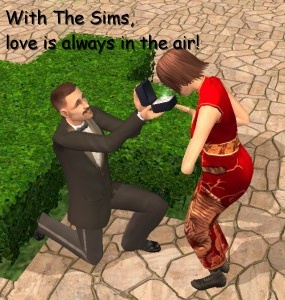 You can't play The Sims without someone falling in love at some point.